The unemployment rate fell to 8.1%, the lowest since January 2009. But don't mistake that decent-sounding factoid for good news. Job creation barely broke even with population growth, and the entire drop was caused by people leaving the labor force. Here's the long story: Jobs are recovering at about the same rate as they did after the 2001 and 1990 recession, except they're recovering from a much, much, much deeper recession. One month shouldn't change anything. So why does each month seem to change everything? Judging from the instant-reaction to the August jobs report -- 96,000 jobs created, 40,000 jobs lost in revisions, unemployment down to 8.1% on falling labor participation -- this anemic report could be Obama's undoing. In fact, it is more accurate to say that it is in keeping with the long undoing on the strong recovery we caught glimpses of early this year. The economy is now officially behind schedule compared to 2011. Average monthly job gains last year? 153,000. This year? 139,000. Over the past three months, the average has slipped to 94,000. That is probably either at, or just below, the rate of population growth. 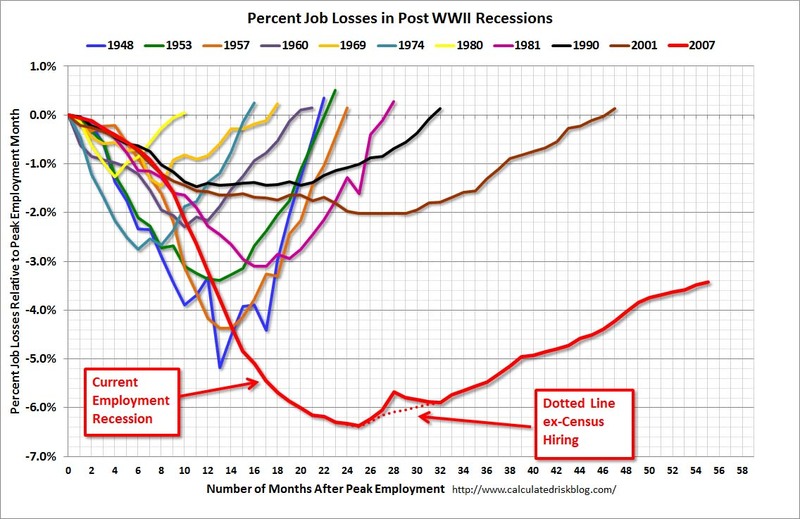 In other words, three years into recovery, we are adding people slowly and adding jobs even slower. Today's unemployment report has a margin of error of plus/minus one hundred thousand jobs. But you don't need to wait for upcoming revisions to know that this report is less like a new data point and more like an old reminder. Government is shrinking, still. Low-wage sectors like food services are growing, still. Unemployment is high for non-college grads and worse for men. The economy is recovering, but slowly, decimal by decimal, and too subtly to make a difference for the millions of Americans who feel locked out. Everybody wants a culprit for bad news, but remember, the news isn't really new. Republicans will continue to blame Obama for failing to create the circumstances necessary for growth. Keynesians will continue to blame Congress for never voting for new fiscal stimulus after February 2009. Others will blame the Federal Reserve for sitting on its hands while the labor market stalls. This jobs report is a Rorschach in which each group will see the conclusions they've already reached. In the meantime, everything is moderately bad and not getting better.